As the captain of the Imperial Army, the no-nonsense Li Shang has to whip a group of ragtag wannabe soldiers in shape in response to Shan Yu's attack on China. He is extremely dedicated to the mission and places duty above all else, however, the arrival of Mulan in his life has complicated his disciplinarian way of life. 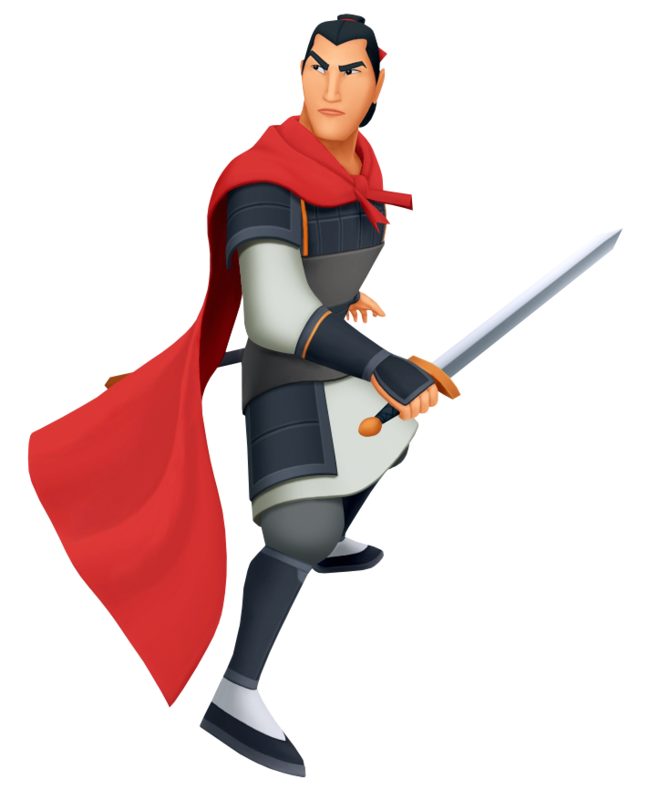 Initially unconvinced that "Ping"(aka Mulan) has what it takes to be an imperial soldier, he agrees to give "him" a chance by assigning Sora and his friends missions, and gradually becomes impressed with the team. When "Ping" saves him from an avalanche, he is finally ready to accept "him" as a full-fledged soldier, only to feel betrayed upon the revelation that "Ping" is actually a woman in disguise. Ordinarily a crime punishable by death, Shang spares her in order to repay his life debt. He remains staunch in his view that Mulan is a liar until he sees for himself that Shan Yu has survived the avalanche, and is instrumental in bringing the Emperor to safety while Sora and his friends deal with Shan Yu. During Sora's second visit to the Land of Dragons, Shang serves as the Emperor's personal bodyguard, but even he is no match for a hooded Riku when the latter arrives to give a grave warning. Nevertheless, he saves Mulan from being crushed to death by the Storm Rider Heartless, an expression of repressed romantic feelings which he is unable to communicate through words. A chance to explore a relationship is granted when Mulan gains equal status as him, but it will take a lot more than love to completely change this soldier into a softie.